View More In Desk Lamps - Page 4. ▲Just peel and stick and ensure the back of your TV is free from dust before installation to avoid falling off! ▲The magnet installation set is not a toy and must not be allowed to fall into the hands of children. ▲The magnet installation set does not contain any customer service components. ▲Ambient temperature also affects the temperature of the LED lamp, you'd better not use in high temperatures. ✔- [EYE-CARING]: Non-Flicking, No dark area, No ghosting, No glaring. Comfortable for your eyes with flicker-free & zero-radiation soft light. ✔- [ENERGY-SAVING&SAFE]: Ultra-low voltage input and Lighting temperature (Capped at 122°F) for absolute safety. ✔- [MULTI-USE]: Great for Music Stands, Pianos, Orchestra Pits, Reading, Work Tables, Mixing Tables, DJ's, Craft Tables and Much More...;Brighten up any activity with the click of a button. 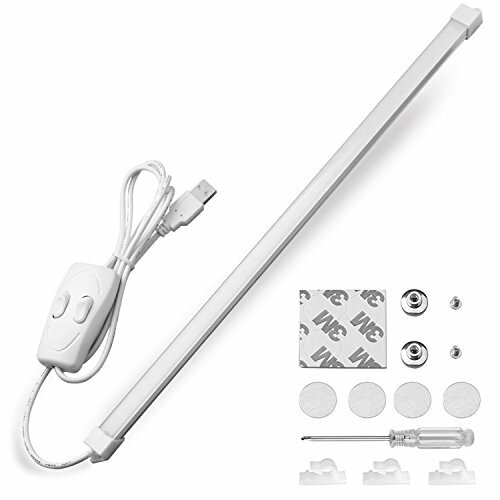 ✔- [LIFETIME&EASY TO INSTALL]: Simply stick to magnet-applicable place or with 3M adhesive plates; Maintains over 25,000 hours of full lumen output, 10 years life span. ✔- [COMPATIBILITY]: Compatible with all standard USB devices, power banks, mobile chargers, PC, laptops, etc. If you have any questions about this product by Qooltek, contact us by completing and submitting the form below. If you are looking for a specif part number, please include it with your message.